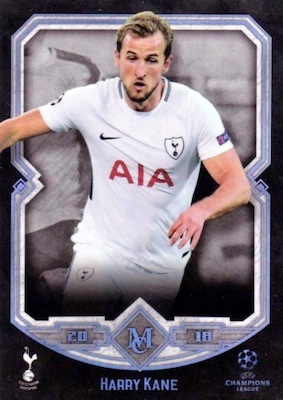 Merging the popular MC and UCL brands, 2017-18 Topps Museum Collection UEFA Champions League brings collectors their first taste of the new cardboard partnership. Exclusive to Hobby, the one-pack boxes include one autograph, one relic and one autograph relic. Showing the relative rarity, every hit is limited to 99 copies or less. Although each box has three hits, the other five cards come from the base checklist. 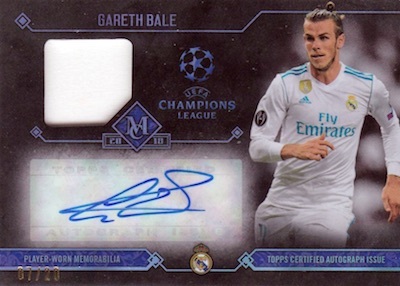 2017-18 Topps Museum Collection UEFA Champions League features up 75 top players in a standard version, plus Sapphire (#/75), Gold (#/50), Ruby (#/25) and Emerald (1/1) parallels. One parallel is expected in each box. Signed cards come two per box, with one of these featuring a memorabilia swatch, as well. The Archival Autographs line takes the familiar insert to some of the top club talent with additional Sapphire (#/75), Gold (#/50), Ruby (#/25) and Emerald (1/1) parallels. There are also Dual Archival Autographs, numbered to 25 or less, for key combos. 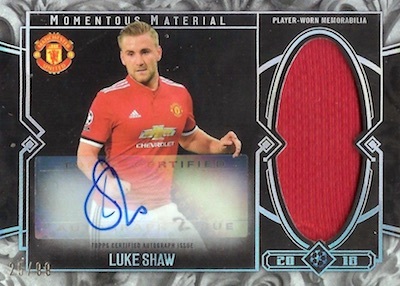 Looking back to standouts from the group stage of the tournament, the Road to Kyiv Autograph cards are limited to 75 or less. The popular Framed Autograph inserts (#/50 or less) are also an option, falling one per case. Both of these sets have Ruby (#/25) and Emerald (1/1) editions. Delivering the other autograph in each box of 2017-18 Topps Museum Collection UEFA Champions League are the signed jersey options. Choices include Museum Autograph Relics and Autograph Jumbo Relics, with parallels numbered to 75 or less. 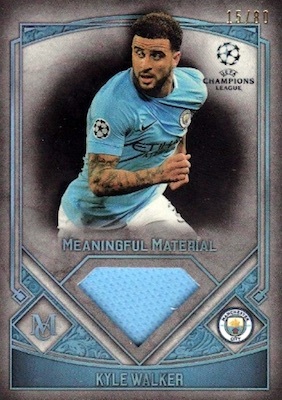 Taking us home, the third hit in every box of 2017-18 Topps Museum Collection UEFA Champions League is a memorabilia card. Meaningful Material Single Relics and Momentous Material Jumbo Relics both have the full assortment of parallels, while the Momentous Material Prime Patch Relics set is numbered to just 10. And last of all, the Single-Player Triple Relics (#/75 or less) insert has signed (#/35) and unsigned versions to chase. PARALLEL CARDS (1 per box): Sapphire #/75, Gold #/50, Ruby #/25, Emerald 1/1. 9 Marcelo - Real Madrid C.F. 15 Ryan Babel - Beşiktaş J.K.
18 Oğuzhan Özyakup - Beşiktaş J.K.
20 Gareth Bale - Real Madrid C.F. 22 Pepe - Beşiktaş J.K.
23 Ricardo Quaresma - Beşiktaş J.K.
39 Keylor Navas - Real Madrid C.F. 49 Marco Asensio - Real Madrid C.F. 69 Adriano - Beşiktaş J.K.
75 Cristiano Ronaldo - Real Madrid C.F. 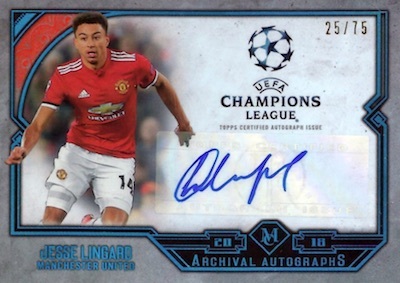 Shop 2018 UCL Museum autographs on eBay. PARALLEL CARDS: Sapphire #/75, Gold #/50, Ruby #/25, Emerald 1/1. MAR-GB Gareth Bale - Real Madrid C.F. 37 cards. Serial numbered #/99 or less. PARALLEL CARDS: Gold #/50, Ruby #/25, Emerald 1/1. AJR-GB Gareth Bale - Real Madrid C.F. AA-CR Cristiano Ronaldo - Real Madrid C.F. AA-JL Jeremain Lens - Beşiktaş J.K.
ADA-RME Cristiano Ronaldo - Real Madrid C.F. 18 cards. Serial numbered #/50 or less. PARALLEL CARDS: Ruby #/25, Emerald 1/1. FA-CR Cristiano Ronaldo - Real Madrid C.F. FA-GB Gareth Bale - Real Madrid C.F. 15 cards. Serial numbered #/75 or less. RTK-CR Cristiano Ronaldo - Real Madrid C.F. 19 cards. Serial numbered #/35. MTR-GB Gareth Bale - Real Madrid C.F. 26 cards. Serial numbered #/99 or less. MMSR-GB Gareth Bale - Real Madrid C.F. MMJR-GB Gareth Bale - Real Madrid C.F. 19 cards. Serial numbered #/75 or less. View the 2017-18 Topps Museum Collection UEFA Champions League checklist spreadsheet.